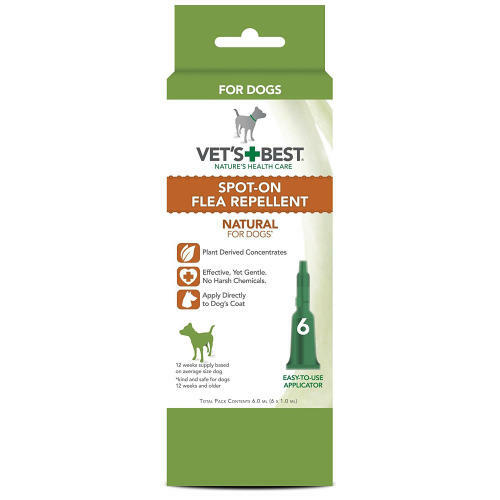 Vets Best Natural Flea Spot On for Dogs is an all natural spot-on treatment that utilises natural plant based extracts to ward off fleas from your dog to provide long lasting pest control when used regularly. Vets Best recommend early and continuous use throughout the year, to maintain pest free pets all year round, without ever having to use harsh chemicals. Safe and kind to use on your pet, whilst remaining highly effective. Margosa (Neem ) Extract: is a natural active substance which has powerful repellent qualities and which helps to gives your pet long-lasting protection against ticks, fleas and mites. It is known as a natural non-toxic option to harsh chemical insect repellants. Citronella: is commonly known as an all-natural insect repellent made from the distilled oils of different varieties of grasses. Citronella works by masking scents that are attractive to insects. The benefit of using citronella as a natural flea and tick repellent is that it is known to be safe and non-toxic to humans and animals. Eucalyptus Oil: an active ingredient present in Eucalyptus oil is responsible for the strong aroma of the oil that helps to repel pests such as fleas. Eucalyptus oil does not kill the fleas but it helps to repels them and keeps them away from your pets. Peppermint Oil: is derived from the peppermint plant, a cross between water mint and spearmint that thrives in Europe and North America. Peppermint is considered as a multipurpose flea control remedy which is natural, safe and effective, as biting bugs such as fleas and ticks don’t like the scent of peppermint. It is also known to soothe skin irritations and itching on the pet's body if they do get bitten. The entire cycle, from egg to adult flea, is complete in 12 – 22 days when temperature and humidity conditions are ideal, but more commonly takes 3 – 4 weeks. Surprisingly, only approximately 5% of a flea infestation is made up of adult fleas on your pet, whereas 95% is in your home as eggs, larvae and pupae. To prevent infestations, you need to treat your pet and home all year round.